It’s crazy how connected math is. Often children struggle in higher math because they didn’t fully grasp a concept from earlier years. Children probably aren’t going to understand decimals without understanding what a fraction is. Can they grasp the concept of negative numbers and not have good number sense? What about adding fractions without common denominators when they don’t know their multiplication times tables? Every lesson in math is an important one, as it is a stepping stone to a higher concept. And today, we are looking at a simple lesson that builds the foundation for adding and subtracting fractions: finding the least common multiple. 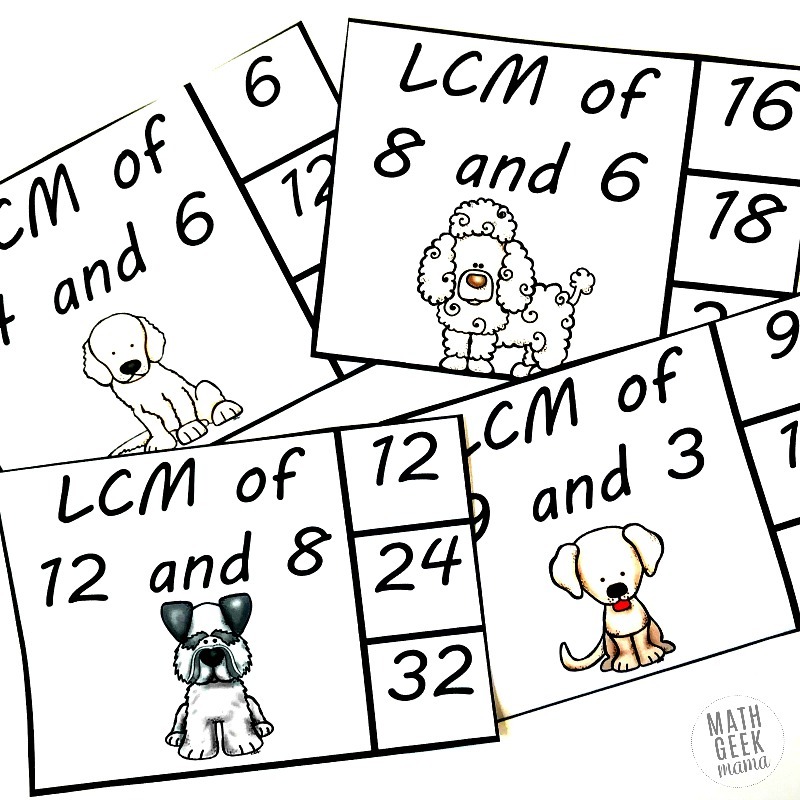 Plus, you’ve find a fun set of least common multiple practice to help build kids’ fluency & confidence. First, we must know what a multiple is. A multiple is simply what we get when we take one integer and multiply it by another integer. So, 4, 8, and 12 are multiples of 4 and of course, the list of multiples will continue as you continue to multiply by 4, 5, 6, 7, etc. Additionally, multiplying by negative integers also results in multiples, but that’s usually not necessary to discuss when you’re first introducing this to kids. 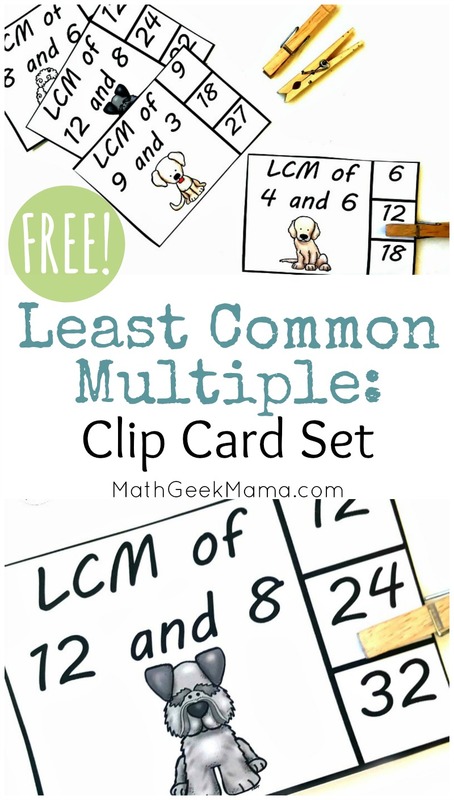 Now, that we understand what a multiple is, it is time to explore what a least common multiple is. Let’s say you have been given the numbers 6 and 8 and you were asked to find the least common multiple. What that’s asking is to find the smallest number that is a multiple of BOTH six and eight. And it is simple to find. We began by skip counting by six and eight and then circle the first number we come to that both lists have (not including zero). Once the list is made, we can easily see that 6 and 8 have two common multiples (there would be more if you keep going)…24 and 48. Twenty-four is the smallest multiple they both have, so 24 is the Least Common Multiple or LCM. Why Do Kids Need to Learn Least Common Multiple? 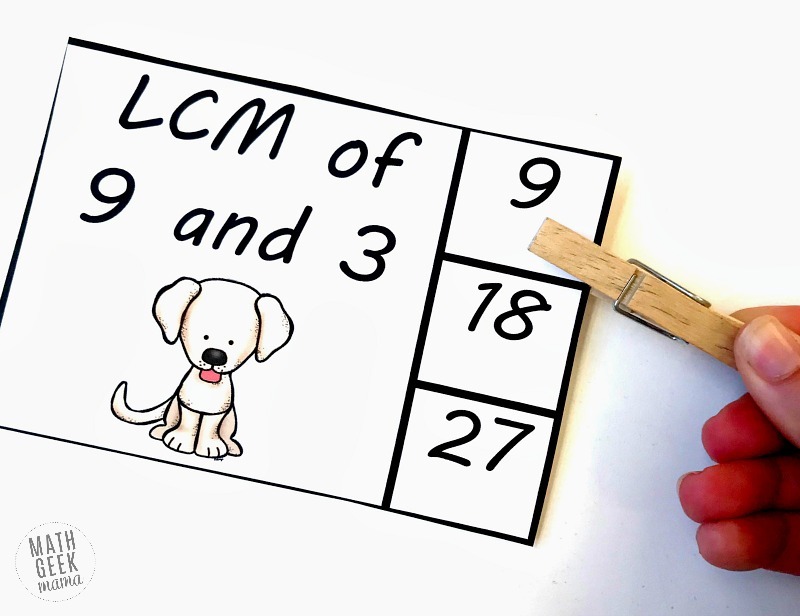 Though there are numerous reasons for finding the LCM, the biggest one is adding and subtracting fractions where the denominators are not the same. It also comes in handy when you creating area models to show how adding and subtracting fractions work. Let’s say, you need to add 1/4 and 2/3. 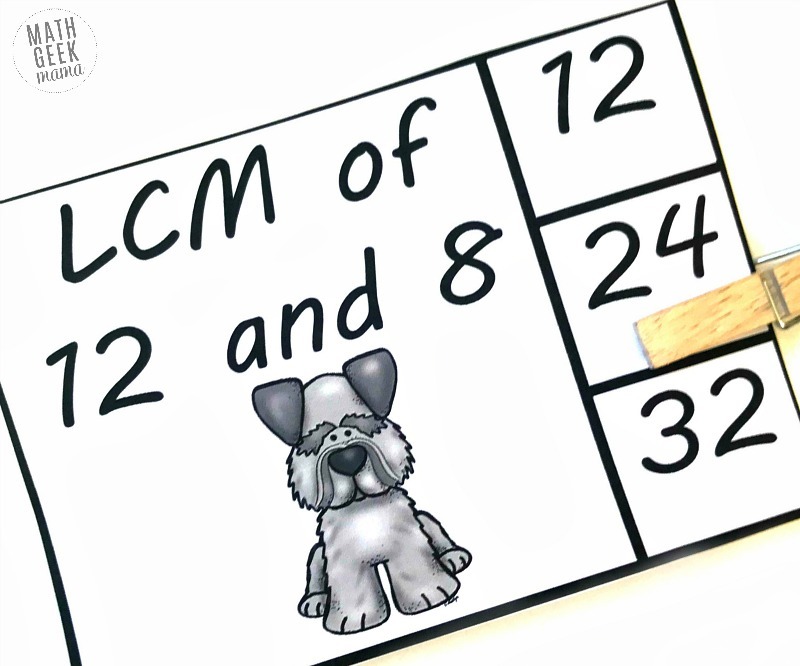 The first step is to get those denominators the same, and we do that by finding the LCM. The LCM is 12, so that becomes our new denominator. From there we find equivalent fractions, and we are ready to add. 1/4 = 3/12 and 2/3 = 8/12 so we add 3/12 + 8/12 which equals 11/12. 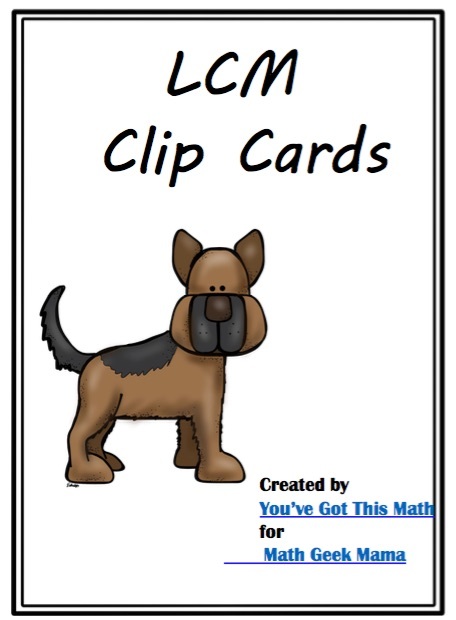 Like any skill, practice is needed and these clip cards are perfect to begin to practice finding the least common multiple. Prep work for these clip cards is simple. To make these self checking, draw a dot on the back of each card to mark the correct answer. Then when kids clip their clothes pin on, they can flip it over to check their work. Then kids are ready to start! These least common multiple practice cards are simple to use, and having only three choices makes the work a little simpler. 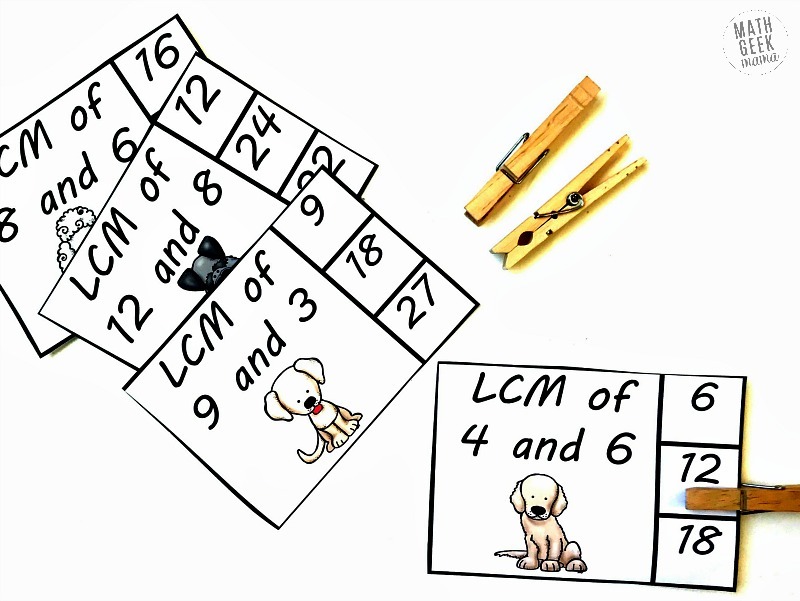 Each clip card starts by asking the children to find the LCM of two numbers. Then to the right, they are given three choices. All our sweet kiddos need to do is start listing the multiples, find the least common multiple, and then place a clothes pin on the answer. It is that simple, but the benefits will be enormous when you begin to tackle those fractions!